Need to install vagrant. The same procedure is applies; grab the installer from ww.vagrantup.com. We can start the cluster setup, so we need the vagrant file for cluster setup using that only we can set it out. Open confi.rb so that you can change the a few parameters to get vagrant up and running properly. You may also want to tweak some other settings in config.rb. CPU, Memory settings can be modified as per your need. If you see list of machines you created then you are finished, you now have a local cluster of CoreOS machines. Create the application in visual studio. Then push that code to the git and also import that code in visual studio team services. Then create the build for that application in VSTS. Please mention the agent to run the build process. In that agent only we can find the build and published file, so we need to mention the same agent in release management then only we can find the published folder and process the deployment easily. Please authorise the azure subscription and it will show the azure web apps in your subrcription, you can choose the azure web app in app service name. Create release for deployment to Azure web app service. Please mention the agent for run the deployment through agent. Please mention the azure subscription and azure app service name. Then release the deployment it will deploy to mention app service in azure portal. CI\CD for Azure web app using VSTS online created. We can run the agent as a service in server using below setups. 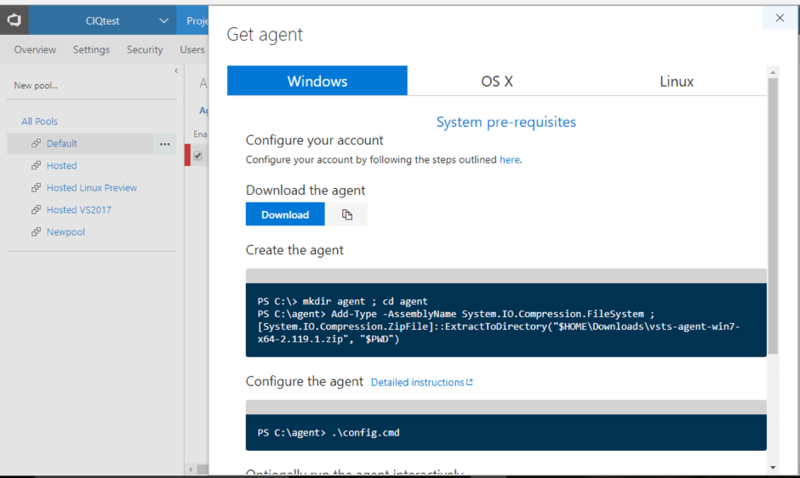 First download the agent setup from agent pools for running that agent as a service in our VM. Enter the PAT(Personal Access Tokens) we can generate from the users security. To add the PAT, please click add and mention the deploy and build agent service then click add or submit. It shows you the PAT please copy and paste it in the cmd. It will ask for an agent pool name, when we give the corresponding pool name the agent will run based on the given pool name. After configuring the agent , please run the run.cmd file in downloaded folder. It can run the TFS agent in our VMs. Finally we are running the TFS agent as a service in our VMs, it can use our system capabilities.